Do you know that in your garden or in the meadow where you like to go for relaxing walks, live plants with healing effects? That’s not all! You can successfully use them in the care of the skin and hair. This includes, among others, dense-flower mullein, Canadian goldenrod and great burnet. Get to know their properties. 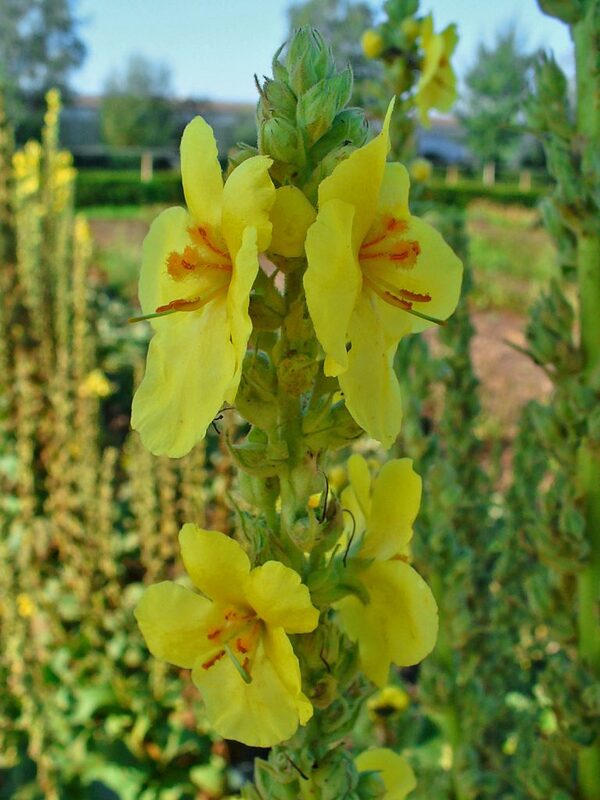 You might have heard of Verbascum densiflorum. It grows where people intervene in the natural environment – in buildings, next to roads, parking lots and landfills. It also occurs in sunny, sandy and stony areas. Do you know that dense-flower mullein grows up to two meters high? You will recognize it by yellow flowers embedded in a long inflorescence. Flowers and leaves are used both in cosmetics and in the kitchen. Flowers help in the treatment of respiratory diseases. They have anti-inflammatory properties, relieve swelling and bruises. They are used to treat skin diseases, such as dandruff, alopecia, eczema or burns. The leaves, however, are used to prepare aromatic tea. Solidago canadensis L. is a common plant, growing on fallows, along roads, on the banks of rivers, in bushes and on the edges of the forest. It occurs mostly on infertile and sunny soils and grows up to two meters. It has small yellow flowers. Flowers, stem and leaves are used in cosmetics as well as for culinary purposes. They have cleansing and soothing properties and also, help in the treatment of psoriasis, folliculitis and acne. Can you believe that the Canadian goldenrod is a rich source of antioxidants? It will certainly take care of the young look of the skin, without wrinkles and discolouration. On the other hand, Canadian goldenrod syrup has a healing effect and is rich in aromatic substances. Sanguisorba officinalis is a common plant, occurring on dry meadows, clearings and slopes, stony and sunny areas. The plant grows up to a height of almost one and a half meter. The kitchen and cosmetics use leaves, shoots and roots. All parts of the plant have healing properties: they shrink and contract blood vessels, accelerate wound healing, relieve swelling around the eyes, can be used in various skin and hair diseases, and in excessive foot sweating.